Alright, guys, get ready to pin this recipe, because you are going to want to refer back to it again and again! I have been cloth diapering & making my own baby wipes throughout my entire motherhood experience. I’ve tried the simple wipe juice options, making extravagant from-scratch wipes, and most recently had just been using water after my diapering budget and diy spirit started flirting with burn out. Enter: this recipe. And you know what? I think I’ve found my happy medium and vigor! But enough about me, let’s talk about YOU! Earth Mama Angel Baby & I want YOU to enjoy this recipe too! So, we are teaming up to offer you the products you’ll need to make it! Enter to win the giveaway at the bottom of this post! NOW, LET’S MAKE THEM TOGETHER STEP-BY-STEP! 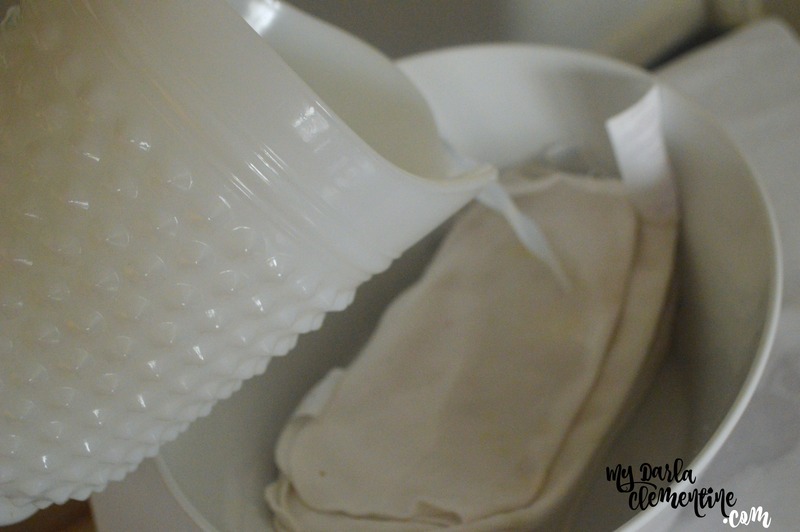 Pour 1 cup of water into a mixing bowl or pitcher. Add 1 Tbsp of Angel Baby Body Wash & Shampoo. Then add in 1/2 – 1 Tbsp of Angel Baby Oil. Stir until well combined. Pour solution over wipes and leave them to sit for 10 minutes. If you prefer to make disposable wipes, cut a paper towel roll in half and pour solution over one half of that instead. Flip the wipes over and allow them to sit for another 10 minutes, ensuring the solution soaks into all of the wipes. If you chose to make disposable wipes, you will then want to remove the inner cardboard tube, and pull the wipes up through the center. That’s it! Store wipes in an airtight container. I like to keep my cloth wipes in this silicone zip bag. They should keep for about a week at room temperature. COMPARED TO PRE-MADE WIPE SOLUTIONS: I have used different wipe juices and solutions in the past. The good news about these are that all they need is water and then are ready to go. The bad news is that are often pretty pricey, and only really serve one purpose. Earth Mama Angel Baby diy wipes, on the other hand, are nearly as easy to make and the products can be incorporated in many areas of your natural baby care routine. (Check out my diy facepaint recipe using the Angel Baby Oil for one example!). Earth Mama Angel Baby offers an enormous range of natural products for mother and babe, addressing wellness and comfort from pregnancy to postpartum, from newborn to toddler. But even more than that, they are a company that shows high levels of support and encouragement to Mama Bears, even down to helping mothers cope with infant loss! See more on their website, Facebook, Instagram,Twitter, Pinterest, and Blog. (Giveaway now closed) ENTER THE GIVEAWAY!! And now, the magical moment you have been waiting for: here is your chance to win an Angel Baby Body Wash and an Angel Baby Oil! No purchase necessary. Entries accepted until Nov 17, 11:59pm PST. Winner will be contacted by email on Nov 18. Must be 18 or older to enter. US participants only. Products for giveaway have been sponsored by Earth Mama Angel Baby and will be shipped to winner directly from them. My Darla Clementine is not responsible for undelivered winnings. This post was shared on Simply Natural Saturdays. Love this idea! So much better than the junk in store bought wipes. What a great idea! I love the earth mama products because they are so pure and natural. Thanks for sharing! What a great tutorial! Maybe I will make some for the new baby coming! I’ve always liked Earth Mama products, will have to try this! Awesome – I have the ingredients already (I LOVE emab!) so I’ll be making up some wipes today! I love how easy these are. Perfect for little ones. Thanks for linking up to Simply Natural Saturdays.